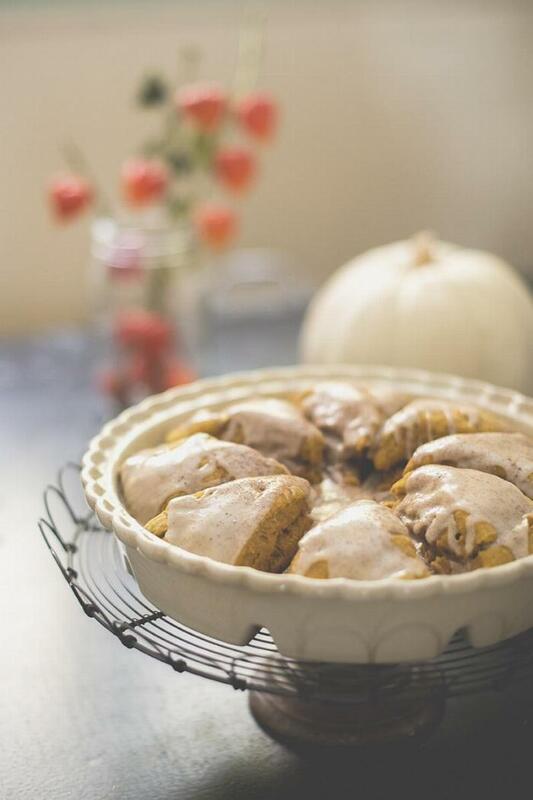 These are really SO easy and taste just like a delicious, autumnal cinnamon roll. I've made homemade cinnamon rolls, and while delicious, they are SO MUCH MORE work than this recipe, and these taste fantastic. I love the rich color of the pumpkin, too. If you don't have a scone pan, you can still do this recipe with a baking sheet, but I love presenting the scones in it. Enjoy! 1Add flour and baking powder to your mixing bowl through a sifter. If you don't have a designated sifter, use your mesh pasta strainer or drink sieve to remove the baking powder clumps from your dry mix. If I don't do this, my son inevitably gets a baking powder burst in a bite and shouts, "Mom, you've got black marazz in here! It's gross!". 2Add spices, sugar, and salt. Stir. 3Add butter. While a pastry cutter works best, if you don't have one (or oddly can't find yours, like me this morning), you can use a whisk or fork to break your butter into clumps. 4Add your pumpkin, nut butter alternative, milk, and vanilla. 5As you stir it up, it's going to SEEM really dry. Like you need to add water. No matter how you stir, it just continues to feel dry. RESIST adding water. Go wash your hands, and then like Paul Hollywood says, "Get your hands in there". Within two seconds of putting your hands in the "dry" dough, you'll feel that there is so much moisture left from the pumpkin to be worked through. Check out the before and after of getting my hands in that dough. 6Pull that baby out of that bowl and toss it on your floured counter, cutting board, or pastry cloth (I loooove my pastry cloth). 7No rolling pin necessary, just nudge it into a round circle about an inch or so tall. 8See how imperfect it is? Still works. Yay. Cut it in half. Then turn and cut in half. 9Put the wedges into your scone pan or place on a parchment-lined baking sheet. 10Bake at 425° for 15-18 minutes until toothpick comes out clean. 11Whisk up the glaze ingredients in a small bowl. The consistency should be just like cinnamon roll icing. Once the scones have cooled enough, drizzle over the scones.